L 44″(112 cm) W 75″(191 cm). Description: Sexes similar. Ash-gray body. Black head and neck with conspicuous white head stripe. Small red cap. Yellow bill. Immatures have gray body with tawny head and neck. 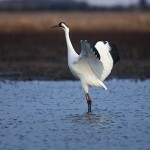 Habitat: Slow moving rivers with bare sandbars and islands for roosting. Nearby wet meadows and croplands necessary for foraging. Where in Nebraska: Accidental. 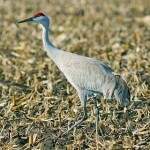 Several individuals have been noted since 1972, usually associated with spring-migrating Sandhill Cranes. 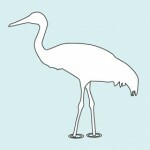 Fun Facts: A group of cranes has many collective nouns, including a “construction”, “dance”, “sedge”, “siege”, and “swoop” of cranes. 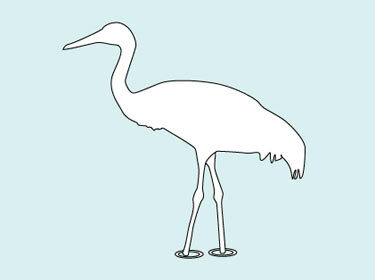 Additional Information: Eurasian species of crane, sometimes called Gray Crane.